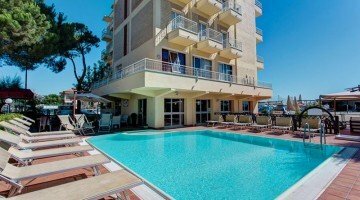 Hotel David , 3 star hotel directly on the sea in Lido di Savio, offers air conditioned rooms, parking and WI-FI. There is a swimming pool with Jacuzzi and many services for families with children. Small pets allowed. 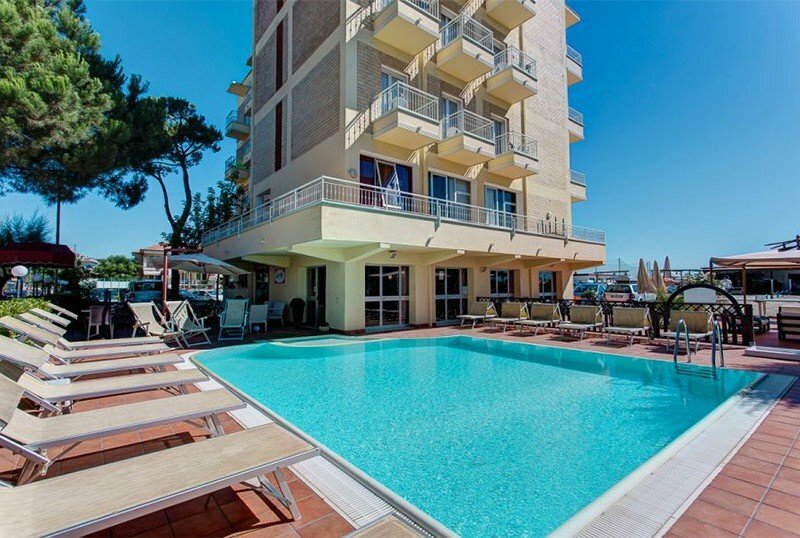 The hotel is located on the sea in Lido di Savio with direct access to the beach, a ten minute walk from the Lido di Savio Village, full of games and attractions for families. Recently renovated, they have a balcony, air conditioning, telephone, WI-FI, safe, TV, private bathroom with shower and complimentary toiletries, hairdryer. SUN : with sea view. SEA : facing the sea. FAMILIES : connecting rooms and family rooms available. Swimming pool, hydromassage, garden, free bicycles, lift, newspapers and theme nights. PARKING : uncovered and free at the hotel. CONVENTIONS : beach, amusement parks, swimming pool, waterslide, INAIL / INPS, law enforcement. Possibility of organizing excursions. Free unlimited admissions to the Parco Acquatico Atlantica in Cesenatico and to the Lido di Savio Village. LUNCH AND DINNER : choice between three menus based on meat and fish, accompanied by buffet of appetizers, salads and mixed side dishes. Cuisine inspired by the Romagna and national tradition. Water, wine, cola and orange juice and soft drinks on tap are always available at the hotel 24 hours a day. In hotel : outdoor playground area, strollers, baby / mini / junior club, live entertainment. At meals : flexible hours at the restaurant, table seats, placemats to color and cutlery, baby menu, possibility to prepare baby food and vegetable broths, baby lunch with entertainers, afternoon snack, bottle warmer. On the beach : entertainment, baby club and junior club, playground area. The structure has a swimming pool with hydromassage and a children's area. Animation for adults and children on the poolside. The Hotel David has an agreement with the Bagno Paolo for which it has direct access without roads to cross. There are playgrounds, ping-pong, children's playground, entertainment, TV. Throughout the summer of 2018, 1 or 2 children stay free. In June We are waiting for you in Lido di Savio to spend a real All Inclusive holiday! Spend the June 2 bridge in Lido di Savio! Our Family Hotel awaits you directly on the sea. Our All Inclusive formula: full board, drinks, full time soft drinks, beach service, swimming pool, entertainment, bicycles, parking. With us, find the presales for Mirabilandia with Bimbo up to 10 years free! In July We are waiting for you in Lido di Savio to spend a real All Inclusive holiday! In August We are waiting for you in Lido di Savio to spend a real All Inclusive holiday!